J Sainsbury and Wal-Mart, the world’s biggest supermarket retailer, are in advanced talks about a shock £10bn tie-up that would create ‎a more powerful rival to Tesco, the current UK market leader. Sky News exclusively revealed on Saturday that the two companies are in negotiations about combining Wal-Mart’s Asda business with Sainsbury’s, in a deal that would send shockwaves through the entire British retail industry. Following the story, Sainsbury’s released a statement confirming the groups were in advanced talks. It was unclear this weekend how a deal would be structured, although one insider said Wal-Mart was likely to reverse Asda into Sainsbury’s while taking a stake in the combined group. Another huge uncertainty surrounding any combination of the UK’s second-largest and third-largest grocers would be their proposals to secure approval from the Competition and Markets Authority (CMA). Some analysts believe a reduction in the pool of national food retailers of‎ major scale would be almost impossible to secure approval for without the disposal of many hundreds of stores. That in turn could pose a threat to substantial numbers of jobs, although insiders said this weekend that store closures and job losses were “not a major factor” in the discussions. One proponent of the tie-up suggested that the CMA’s decision to wave through Tesco’s recent £3.7bn takeover of Booker, the wholesaler, had ‎given a green light for others to explore industry-reshaping mergers. The CMA is likely to look at store conflicts on a localised basis, according to one insider. Liberal Democrat leader Vince Cable said: “The grocery market – and the British shopper – already suffers from the mid-market being dominated by just a handful of big players. Sainsbury’s has a predominantly southern bias to its store estate, while Asda, which is headquartered in Leeds, is more heavily concentrated in the north of England. Britain’s traditional retail industry is under enormous pressure from the prolific growth of online rivals which are not saddled by the fixed costs of bricks and mortar‎ players. Asda and Sainsbury’s have also faced a big challenge from the emergence of the German discounters Aldi and Lidl, ‎which have begun to build a big presence in the UK. 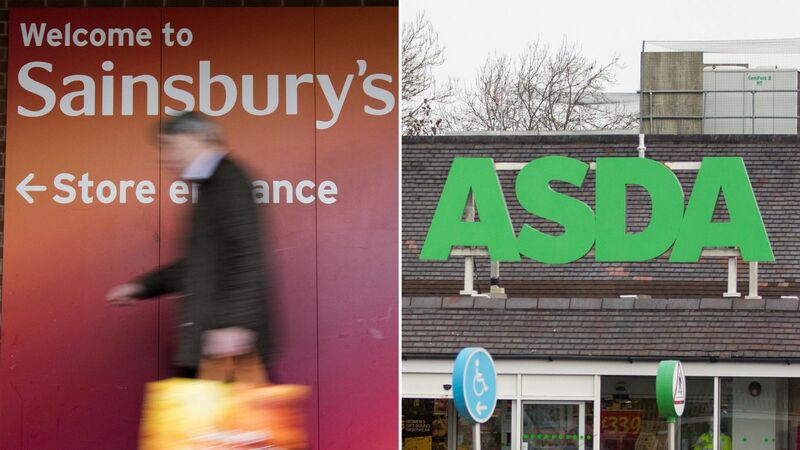 A tie-up would give the two British chains even greater buying power but would inevitably lead to greater scrutiny from regulators such as the Groceries Code Adjudicator, which was set up to protect small suppliers. One source close to Wal-Mart said the merger would allow the two companies to invest in providing more products at lower prices. A deal would be likely to require the blessing of the Qatar Investment Authority, which holds a 25% stake in Sainsbury’s having bought into the chain more than a decade ago. If concluded, a deal‎ would be the most significant in the UK’s food retailing sector since Wm Morrison bought Safeway to give it a UK-wide presence in 2004. Sainsbur‎y’s has itself been acquisitive in recent years, snapping up Argos and examining takeovers of wholesale businesses such as Palmer & Harvey, which collapsed into administration last year. The leadership of ‎a combined Asda and Sainsbury’s would be an intriguing detail of a deal, with former Sainsbury’s director Roger Burnley recently being promoted to become chief executive of the Wal-Mart-owned chain. Mike Coupe, the Sainsbury’s chief executive, is said to have been a driving force behind the proposed merger. The execution risks attached to a tie-up would be crucial to the fate of David Tyler, the Sainsbury’s chairman, who has just seen an attempt to merge Hammerson, the commercial property company he chairs, abandoned after opposition from investors. A second attempt to secure large-scale consolidation‎ in the retail industry would, analysts say, underline the belief that bigger companies will be better-placed to withstand the competitive threat from Amazon and other big digital retailers. Among the advisers said to be working on the deal are Morgan Stanley and UBS for Sainsbury’s, with Rothschild advising Wal-Mart. Asda did not return calls seeking comment.